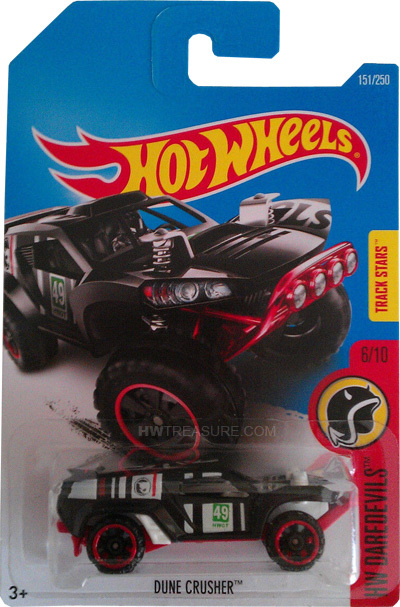 151/250 is a 2016 Treasure Hunt and 6/10 in the HW Daredevils series. The black truck has white and red vertical stripes of various widths on the sides. In one stripe is a black low production symbol and on the door is a green square with “49” and “HWGT” under it. The vehicle has a white interior, off-road 6-spoke wheels with red rims, and a red Malaysia base. 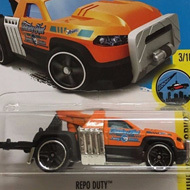 It can be found in mix “Q” of 2016 Hot Wheels mainline cases. The Dune Crusher made its debut in the 2014 HW Off-Road series as the Land Crusher. The truck is a unique design customized for off-pavement racing.